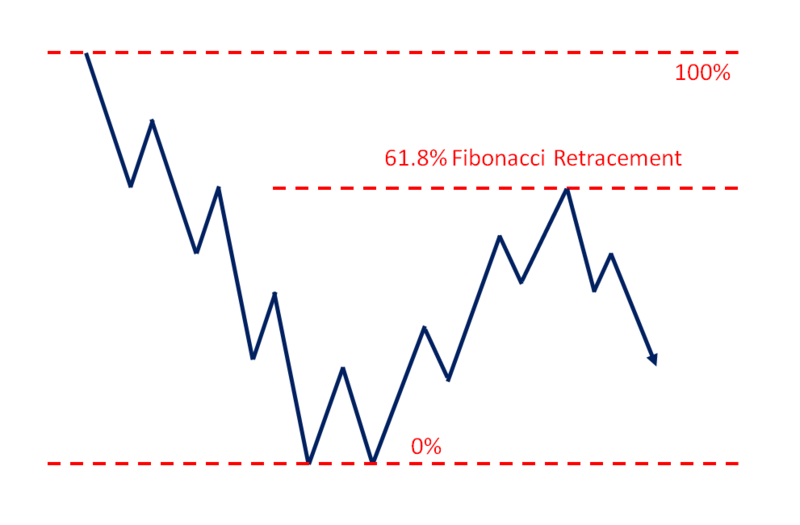 Fibonacci Analysis is one of the most valuable and easy to use tools that we have as market participants. 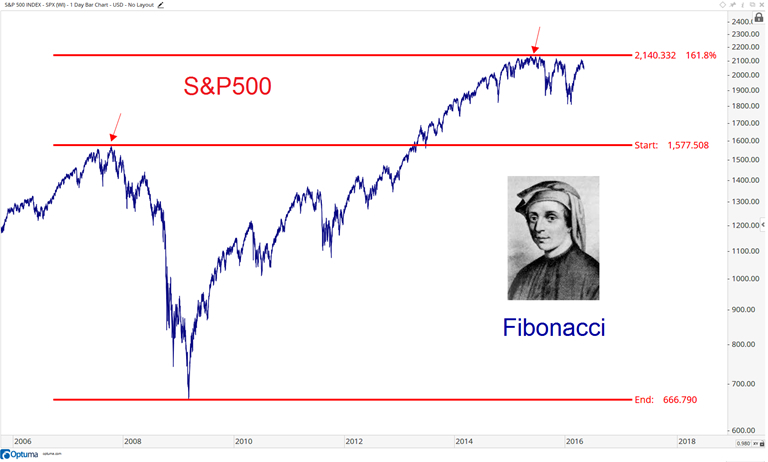 I’ve studied supply and demand behavior for over 15 years and I find myself using Fibonacci tools every single day. These tools can be applied to all timeframes, not just short-term but longer-term. In fact, contrary to popular belief, technical analysis is more useful and much more reliable the longer your time horizon. Fibonacci is no different. 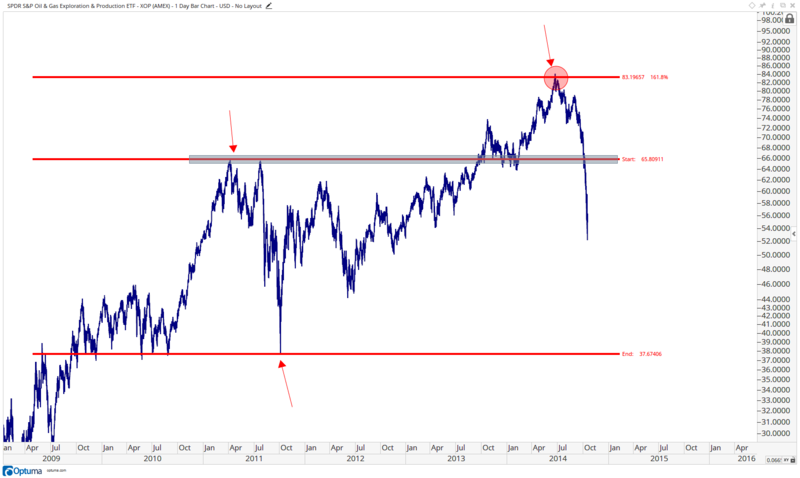 Here is the S&P500 going back to the peak in 2007. 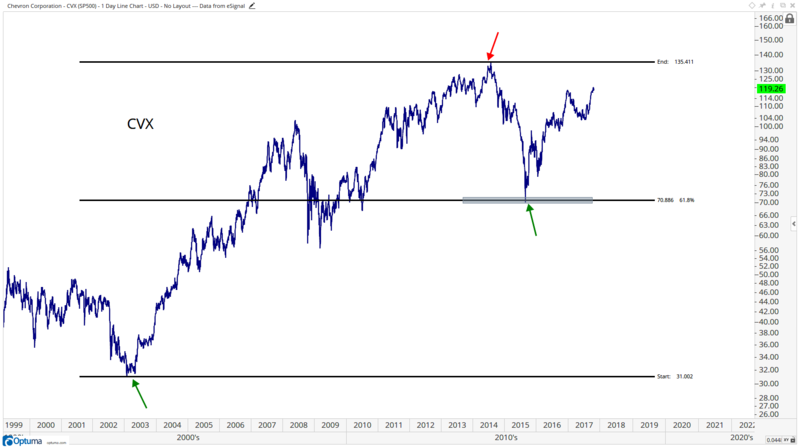 After breaking out in 2013, the market stopped at exactly the 161.8% extension of that entire 2007-2009 decline. That wasn’t a coincidence. I’ll do my best to explain why throughout this page. First of all, let’s discuss the “stigma” that surrounds Fibonacci analysis. The academic community hates it and I think the fundamental guys hate it even more. The funny part is when markets are crashing, they’re the first ones calling us technicians asking which are the next levels to watch. We hold our heads up high and just tell them, and let them keep convincing themselves they don’t need to analyze price behavior. It’s their loss, not ours. Media-wise, they definitely hate it. On two separate occasions, on two different TV networks, I’ve been told my the producer a couple of minutes before going on live that, “We don’t use words like Fibonacci around here, so please do not mention that”. I kid you not. We first see Fibonacci in Indian mathematics and is attributed in part due to work done in 200 BC by mathematician and author Pingala. We don’t know much about the author, but outside of India, the Fibonacci sequence first appeared in Liber Abacci in the year 1202, a book on arithmetic written by Leonardo of Pisa. We know him today as Leonardo Fibonacci. There is a statue of the original Big L in Pisa, Italy. It’s hard to find, but I explain how to locate the statue here for future math nerds on vacation. Fibonacci imagines a biologically unrealistic scenario for the growth of a population. 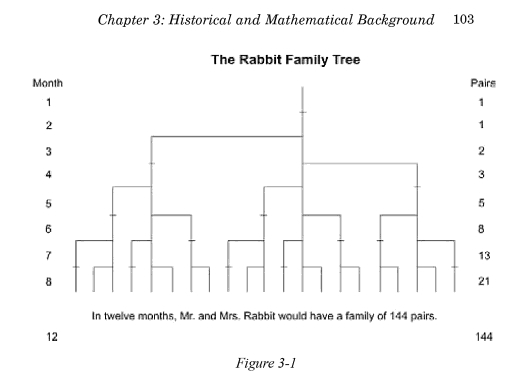 The amount of Rabbits increasing as months pass by is the Fibonacci sequence. What we know is that each pair including the first pair needs 1 month to mature. Once the pair of rabbits are in production, they birth a new pair each month. Since they need a month to mature before, the number of pairs is the same at the beginning of the first and second months. That’s why the Fibonacci Sequence starts with 1,1. In the second month, the first pair doubles so the sequence expands to 1,1,2. After 12 months, there will be 144 pairs of rabbits. But it’s not the answer to the problem that is brilliant. What we want to focus on is the way in which we arrived at the solution. You see, if you add up any two adjacent numbers in the sequence you’ll arrive at the next number in the sequence. 1 plus 1 equals 2. 1 plus 2 equals 3. 2 plus 3 equals 5. 3 plus 5 equals 8 and it goes on and on…. This Fibonacci Sequence is how we calculate the Golden Ratio. After the first few numbers in the sequence, the ratio of any number to the next higher number in the sequence (adjacent to right) is approximately 0.618 to 1. Also, the ratio of any number to the next lower number (adjacent to left) is approximately 1.618 to 1. The further along you go into the sequence, the closer those ratios approach 0.618 and 1.618. Feel free to follow along on your calculator. 34 divided by 55 gives you point 0.618. If you move along the sequence and divide 610 by 987, once again you get 0.618. Now, flip the math and divide each by the previous number in the sequence. For example, 89 divided by 55 gives you 1.618. 377 divided by 233 gives also gives you 1.618. There are two simple ways that these Fibonacci numbers can be used. 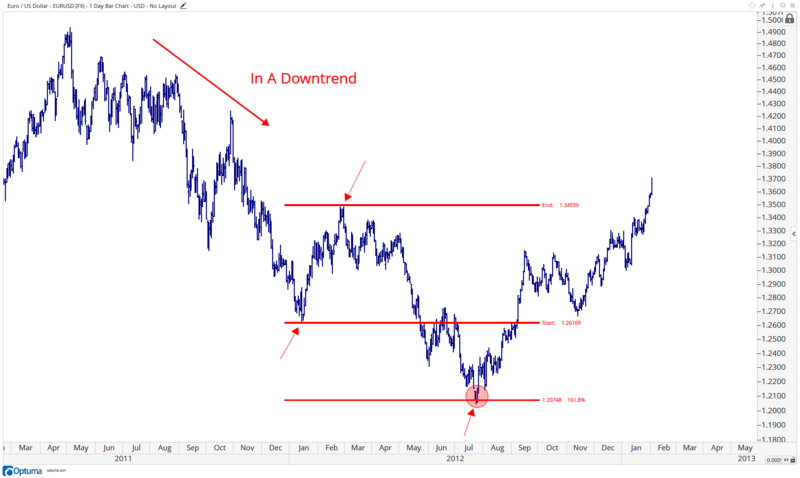 Retracements, which are for counter-trend purposes, and Extensions which are used for ongoing trends. 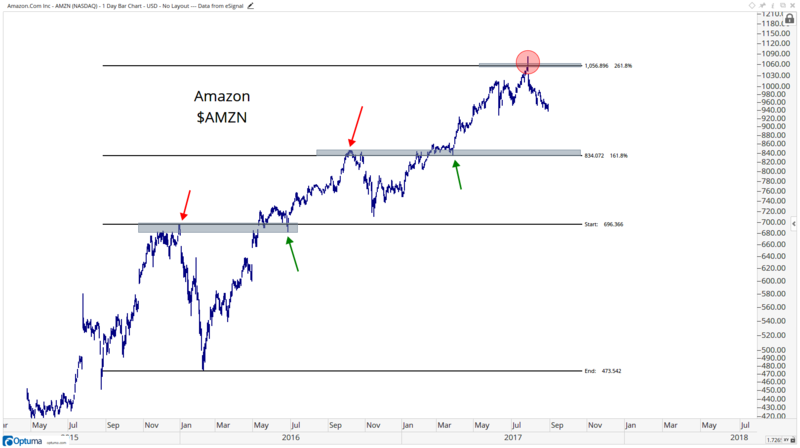 Both can be very helpful in downtrends as well as uptrends. 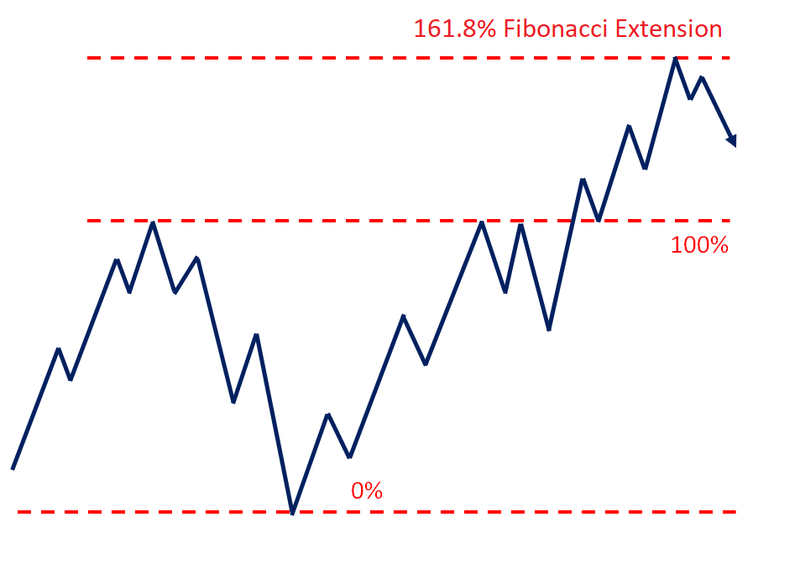 I find Fibonacci analysis more helpful in long-term uptrends. 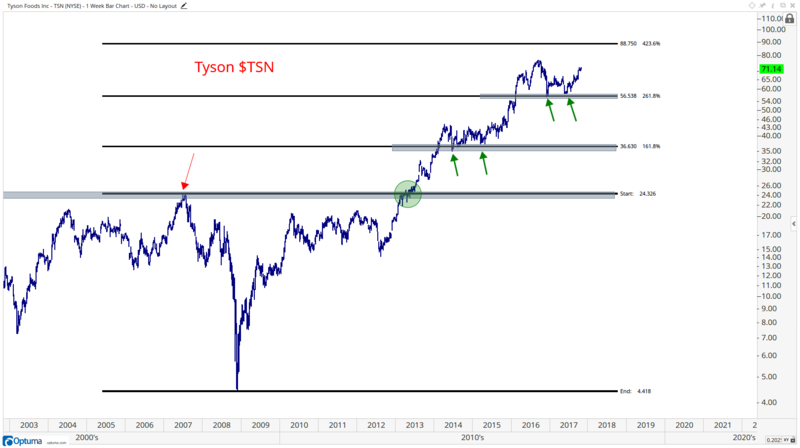 Even if you’re a shorter-term trader, Fibonacci analysis done on your short-term time horizon is going to be more beneficial, in my experience, if it is in an asset that historically has gone up over time. To the downside, I would argue that the longer-term downside extensions rarely work. But in the shorter-term extensions absolutely do. We’ll get into the dynamics of it now, but I wanted to preface with that so you have that context as we move forward. 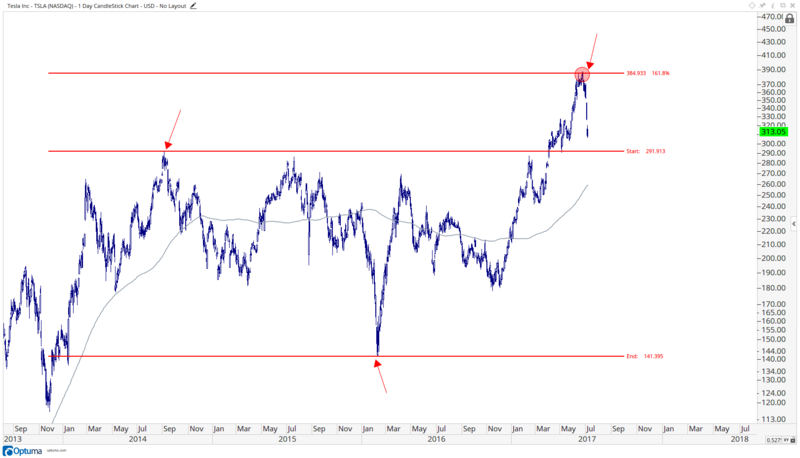 These Fibonacci levels can be used to calculate targets regardless of the asset class. We can be looking at U.S. stocks or sector ETFs, Indexes like the S&P500, Futures Markets, Currencies, etc etc. 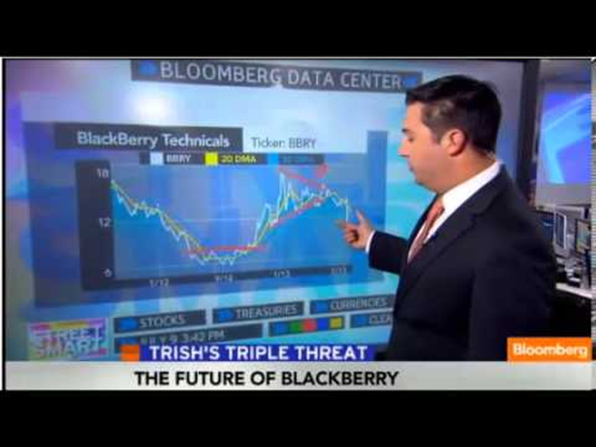 Also, remember that the market is fractal. 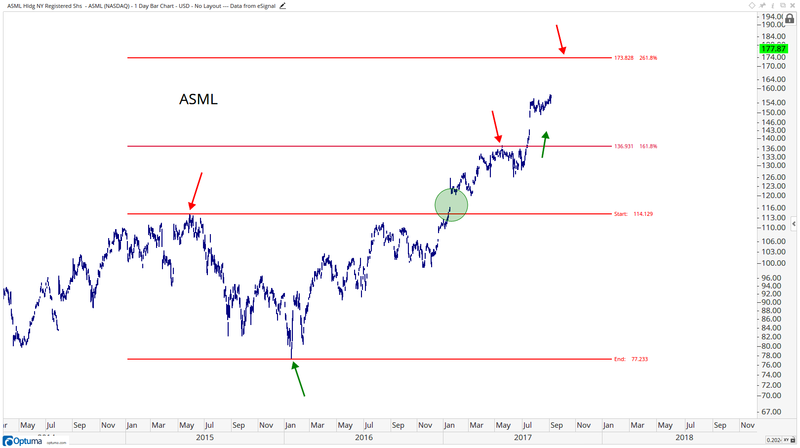 These levels often come into play on longer-term weekly timeframes, intermediate-term daily timeframes, and even intraday. NOTE: when I draw these lines, I don’t calculate the exact low to the penny or exact high to the penny. Some software providers do that for you automatically but others don’t. It doesn’t matter either way. We just want to get very close. With Fibonacci, or with support and resistance and even trendlines, we want to draw these levels with crayons, not sharpened pencils. So you’ll never see my Fibonacci extensions match up to the penny. My time is better spent doing other things. Besides, the market doesn’t react to the penny either, it respects the areas. That’s the point of this. Think of supply and demand like a mattress, with a little bit of give. Here is Tesla in 2017 getting up to the 161.8% extension of the 2014-2016 decline. This doesn’t just happen by coincidence. In these examples you can see that 144 divided by 55 (2 spaces to the left along the sequence) gives you 2.618 or 261.8%. You get the same answer if you divide 2585 by 987 and ever combination moving on gets closer and closer to exactly 2.618. Notice how the slope of the trend accelerated once the stock was finally able to get through the 161.8% extension. 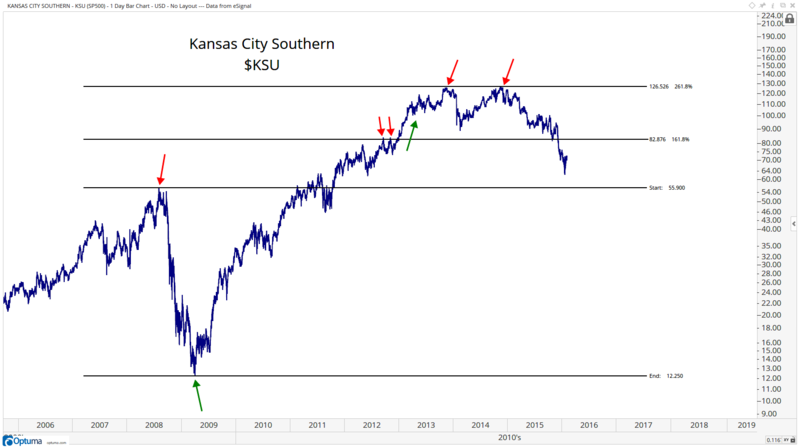 We can see a similar phenomenon in Kansas City Southern $KSU. As you can see below, prices stalled in late 2012 near the 161.8% extension of the 2008-2009 decline. After some consolidation, once prices were able to break out again, things really started moving fast. This should be expected. In the case of Kansas City Southern $KSU, prices were unable to exceed the 261.8% extension after failing twice. Down we went from there. 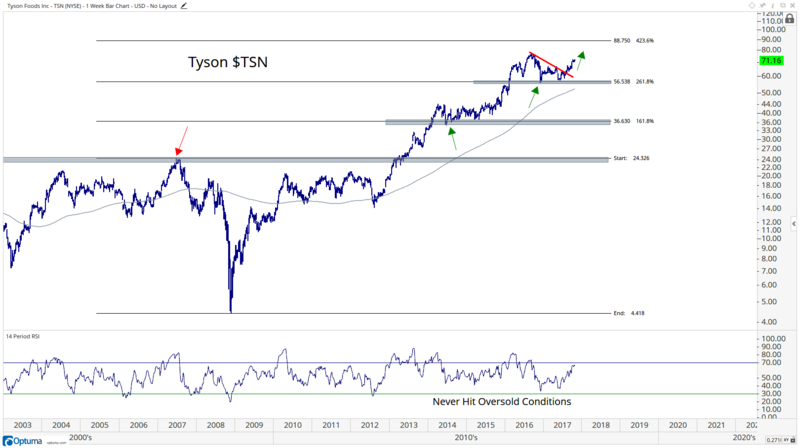 The inability for prices to get beyond this extension level is information in and of itself. From an execution standpoint, once our upside targets are hit, in this case 126, there is no reason to be long unless we are above 127. 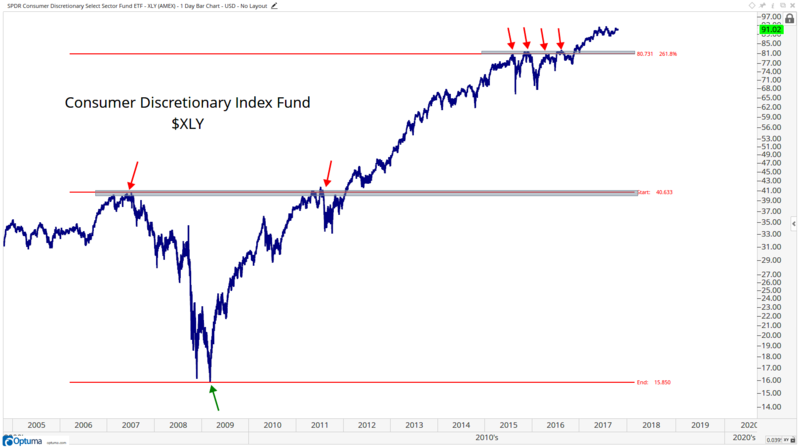 That’s the mentality here: we want to know that we’ve cleared this level before getting as aggressive again as we did once price got through 83 in late 2012. The moving average is used to help identify that the trend has been up and then the momentum indicator below also confirms this. So when prices are holding above a key Fibonacci extension, and momentum and the smoothing mechanism are confirming the uptrend in price, the more conviction we can have holding a long position against that level. In other words, we would keep stops below that extension level and/or only be long if we’re above it. One thing I would like to reiterate is that only price pays. Supply and demand is based on support and resistance defined by prior levels where shares changed hands. Fibonacci, just like every tool outside of price, is only supplemental. 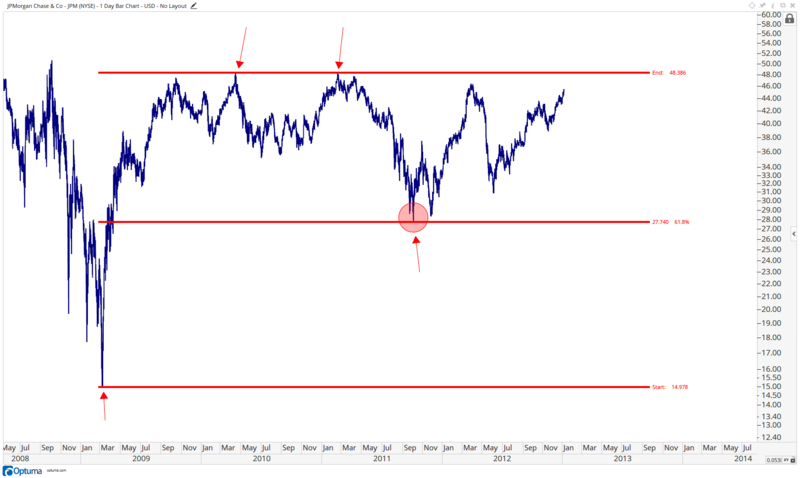 Fibonacci works best when key levels coincide with former support or resistance. But again, all of this is just a supplement to price, just like volume, or momentum, or the use of smoothing mechanisms, or sentiment or seasonal studies. 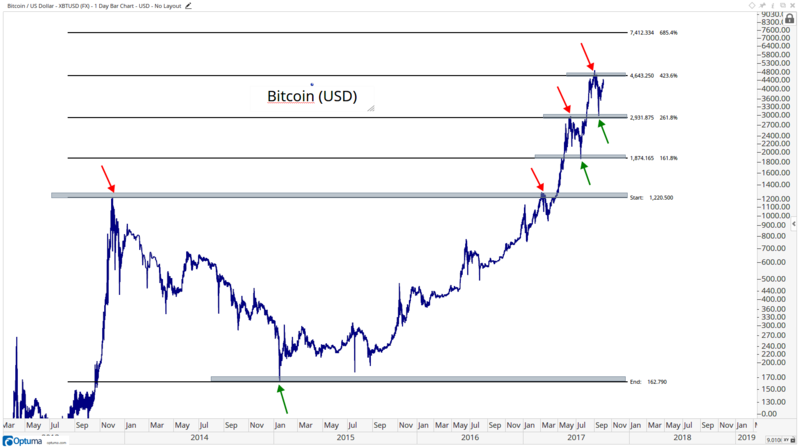 Only price pays, but Fibonacci certainly helps. In most cases, it helps a lot!